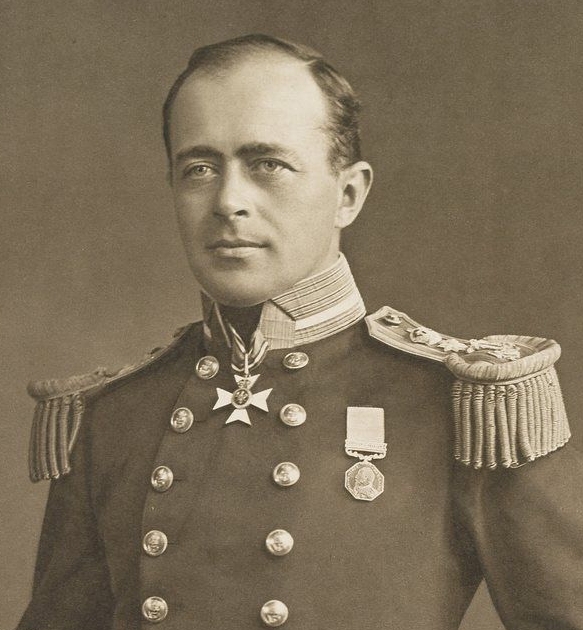 Captain Robert Falcon Scott is a legend of Antarctic Exploration. Perhaps more famous for his death and the mistakes that he made leading up to it, rather than his achievements and career. Who was this man? What made his name virtually inseparable from the history of Antarctic Exploration? 1. Scott was born on the 6th of June 1868 In Devonport, Plymouth in the United Kingdom. His father was a brewer and a Magistrate. Devonport is currently the largest Naval base in Western Europe. 2. Scott began his career in the Royal Navy in 1881 as a cadet of only 13 years old. 3. Scott volunteered to lead the famous British Discovery Expedition of 1901 – 1903, not for the interest in the Antarctic – but rather an opportunity for a first command after a chance meeting with Sir Clements Markham the then president of the Royal Geographical Society in 1899. Polar party – Scott, Oates, Wilson and Evans. Photo credit: British Library. 4. The Discovery Expedition has both scientific and exploration objectives, including a march towards the pole – Scott’s first attempt. He was joined by Ernest Shackleton on this trek.. Shackleton later succumbed to the harsh conditions and led to a falling out with Scott which continued long after the expedition. 5. Upon return from the Discover Expedition – Scott was promoted to Captain and became a Commander of the Royal Victorian order. He later became commander of the HMS Albemarie – A battleship. 6. Scott married Kathleen Bruce in 1907, they met at a private lunch. She was a socialite and cosmopolitan. They married in September 1908. They had one son, Peter – who later founded the World Wide Fund for Nature or WWF. 7. Scott returned to the Antarctic with the ill-fated Terra Nova Expedition of 1910-1912. Where he attempted to be the first man to the South Pole. This trip is often criticised for its poor preparation including taking ponies instead of dogs to haul the sleds through the snow. Scott arrived at the pole to find he was beaten by just 5 weeks to the pole by Roald Amundsen – The Norwegian explorer. 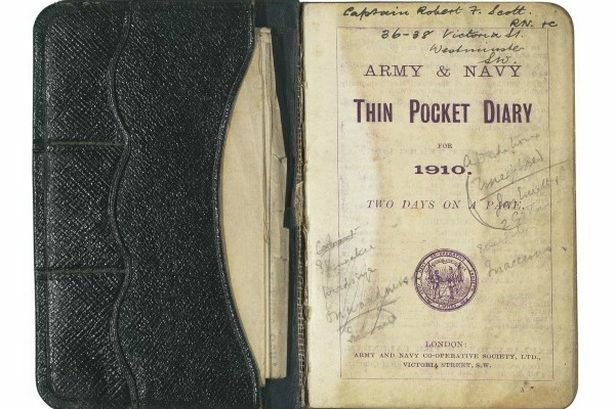 Captain Robert Falcon Scott pocket diary. Photo credit: British Library. 9. Scott was a meticulous diary keeper, and died on his return back to his camp after reaching the pole. He died on the 29th of March and his final diary entry read..
We took risks. We knew we took them; things have come out against us, and therefore we have no cause for complaint, but bow to the will of Providence, determined still to do our best to the last .. Had we lived, I should have had a tale to tell of the hardihood, endurance, and courage of my companions which would have stirred the heart of each and every Englishman. These rough notes and our dead bodies tell the tale, but surely, surely, a great rich country like ours will see that those who are dependent on us are properly provided for. 10. 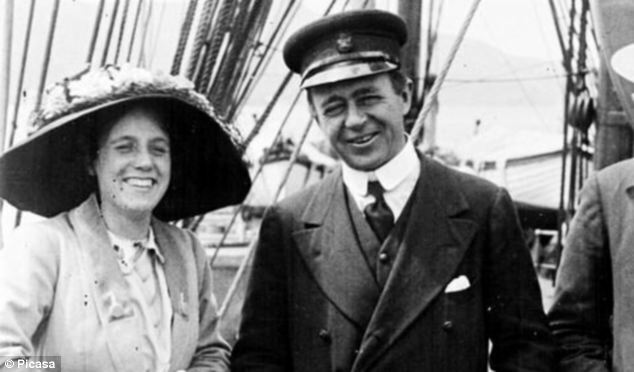 News of Scott’s death reached the world on the 10th of February, 1913 when it was announced with the arrival of his ship and expedition party on board the Terra Nova in New Zealand. Within days Scott became a national icon. Chimu Adventures offer a range of different trips to the Antarctic including the epic – In the wake of Scott and Shackleton departure. The Ross Sea region of Antarctica is one of the most remote places on Planet Earth and one of the most fascinating places in the continent’s human history. This is a unique opportunity to experience nature on a scale so grand there are no words to describe it.